Get Our Teardrop Banner Flags Custom Printed With Your Logo! With the unique teardrop shape, this banner is designed to change direction to suit the wind conditions, ensuring your brand is always seen at the perfect angle. With the ability to work just as well indoors, you can't go wrong with this great banner choice to promote your business. Size: 2, 3, 4m options. Decoration Options: Full colour printing front and back. Or block colour printing of your message. This banner comes as a complete kit, complete with stand, carry case and all equipment required for setting up. 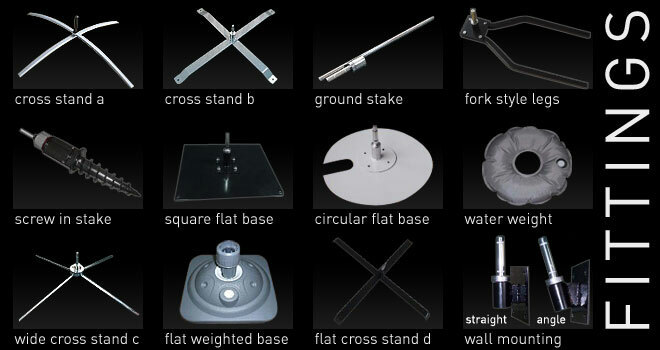 We also supply optional water weight or stake fitting for indoor and outdoor events and functions. Our stake fitting features a swivel so your banner will always follow the wind direction and be on display at all times. All banners come complete as a kit. Ready to assemble straight from the premium carry bag that they are packaged in.